This stunningly bright moving yoke spotlight boasts a devastatingly powerful 440W LED engine and precision-engineered optics for pro-grade performance that will leave a lasting impression on your audience. 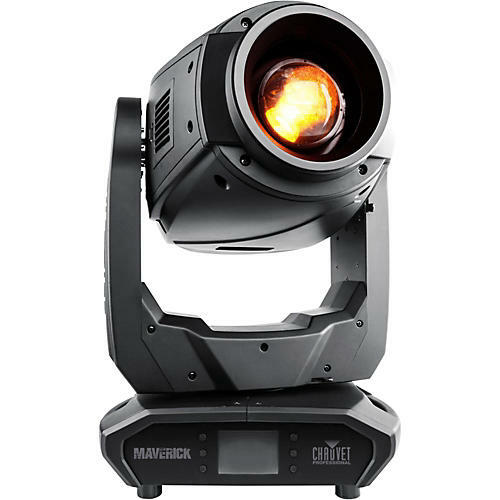 The Maverick MK2 Spot moving-head light features CMY + CTO color mixing, two 6-position rotating slot and lock gobo wheels, and a 7-position + white color wheel. You’ll also appreciate its variable-frost, 3-facet prism and 13–37º zooming beam angle. Used in conjunction with multiple Maverick MK2 Spot units, you can create a dazzling light show that’s as precise and complex as you’d like it to be. Control it as you see fit with DMX, sACN, Art-Net, or W-DMX. With the Maverick MK2 Spot’s abilities, you’re only limited by your creativity.